The film had a special screening attended by some Bollywood celebs. Ribhu Dasgupta has directed the latest suspense thriller, and it also stars Nawazuddin Siddiqui and Vidya Balan in significant roles. Below are the Te3n celeb reviews. The story visible in the film’s trailer looks interesting. The story of the flick revolves around a grandfather whose granddaughter gets kidnapped and remains missing for over eight years from that incident. While he was still searching for her, a twist comes into the picture as another girl goes missing in the same way. Nawazuddin is playing the role of a police officer who gets turned into priest as he couldn’t find Angela (granddaughter). Vidya Balan is also portraying the role of a policeman who comes into play when the second incident takes place. The crux of the story remains whether both the girls were found and culprit gets nabbed, or the two girls remain missing. The film is majorly shot in Kolkata. Vidya is in a particular appearance, but still an important part of the story. “I am playing a cop in the film. It’s a special appearance, but I was excited about doing it because it’s a fabulous script. I’ll get a chance to shoot again in Kolkata with Mr Bachchan, Nawazuddin Siddiqui and Sujoy,” Vidya had told The Reporter Times. Te3n featuring Amitabh Bachchan got cleared with no issues and cuts by the censor board as in the case of Shahid Kapoor’s Udta Punjab. “We viewed the film and found it powerful and relevant. The content is hard-hitting. And because the theme is crime and investigation a UA certificate was warranted. But to cut even a single moment would have harmed the film,” a source from the censor board told TRT. Check out the below-mentioned Te3n reviews by the critics taken from the official Twitter handles. me watching #TE3N ?? ?… Thriller &how! 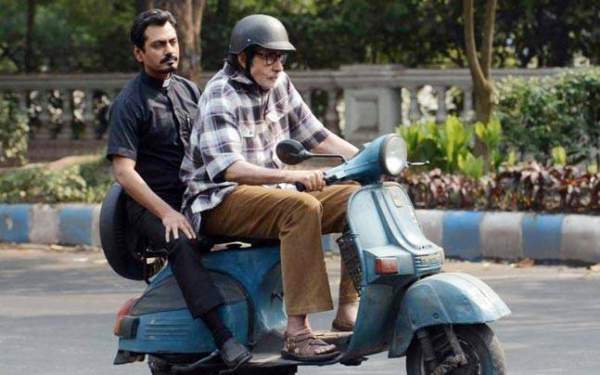 Bawse actors @SrBachchan @vidya_balan @Nawazuddin_S-In one film! #RibhuDasgupta @sujoy_g ??❤️??? Watched #TE3N @SrBachchan sir your struggle as the helpless grandfather was just magical. Very real and gripping. @writish job well done ? Cudos to the casting team of #TE3N @CastingChhabra @MukeshChhabraCC #indu loved your scenes with @SrBachchan full attitude with Chasma ? Stay tuned for the latest news and Te3n 1st-day box office collection updates.